Joomla noob here. I've installed vanilla Joomla 3.5.7. Installed a second language (Russian), made it a default language for the site and for the administrator, published it as a content language. I can see that the in the whole site, the line "Login Form" can only be found in administrator/language/en-GB/en-GB.mod_login.ini. 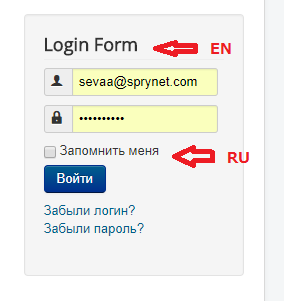 The file administrator/language/ru-RU/ru-RU.mod_login.ini also exists, but for some reason, it's not being picked up. This is the title of the Module - that is hand-written and editable. You can write anything you want on it. If you go to the Modules' Manager, you will be able to find this module - click to edit it and you can type anything as the Module's Title. You can even hide the title from showing. Actually, for multilingual sites, the Joomla!-core approach is to replicate the content items for each language. So, if you have 2 languages, you will need 2 of the same modules - One for English and one for Russian. For each language, you will translate anything that is up to you to be translated. You also set the language for each module, from their Language Selection field and finally, if it applies, you also make the menu items assignments for each one - so it should be assigned to menu items of its language. Why my pages come in English even the current language is another?